The universal language of love is felt in the endearing gestures of these figures. Symbols such as hearts and flowers are frequently carved on the piece or held by figures. Expressive sculptures are lovely gifts for engagements, weddings, Valentine’s gift, or whenever someone wants to express love for another. Many Willow Tree figures are about love – sharing love, being surrounded by love, experiencing love. 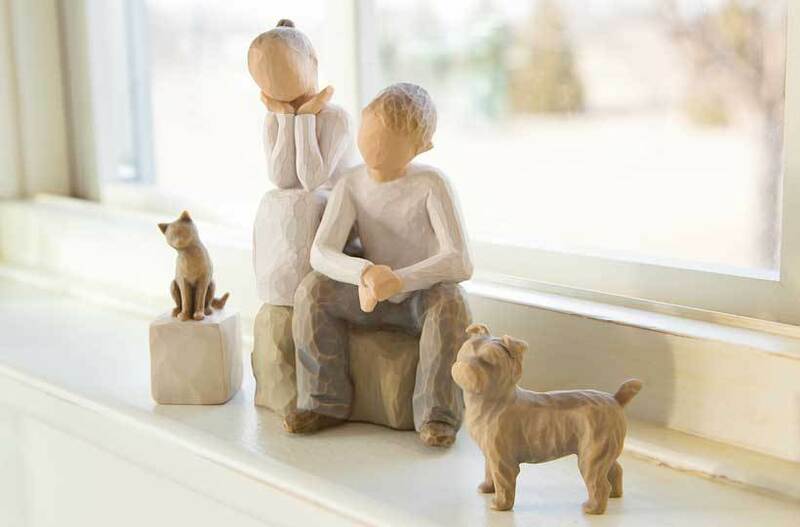 Susan's classic sculptures express these feelings with traditional icons of love – flowers, hearts, roses – but bring the feelings to life in a personal way. The graceful movements of dress and body, hair and hands communicate uplifting messages that ‘you are loved’. Gifts of love are tangible reminders for spouses, parents, children, girlfriends and boyfriends.